We provide residential and commercial gutter cleaning in Glenrothes. Overflowing gutters can lead to structural issues such as leaks and dampness in the home, so our gutter repair service is aimed at fixing these issues. Get in touch for a free quote. We can clean gutters over hard to reach areas such as awnings and extensions, due to the tools we come equipped with. Gutter cleaning can be inherently dangerous, but we use a stay bar to improve our clearance at the gutter line, a ladder m8trix to provide solid grip on the ground and we always work in teams. You can contact us on 07856 539 498 or 01383 271 418, email at chris@fifewindowcleaningservices.co.uk or use the contact submission form on this site. We empty all downpipes as standard; offer a before and after photo should you ask for this (which we fully understand) and offer you the option to have the down pipes covered with a wide gutter mesh. 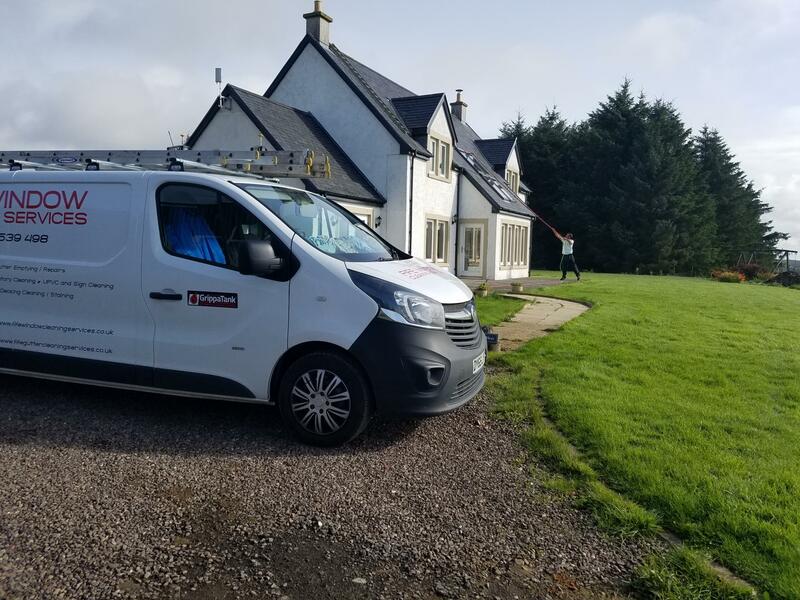 We remove all soil and water from gutters and also dispose of the waste, we can clean the uPVC exterior of the gutter lines in all parts of fife too should this be requested. uPVC cleaning can make your home exterior really stand out, the change from worn gutter lines and uPVC to cleaned surfaces can be quite eye catching. The cost to replace gutters can be vast and necessary, this can however be prevented through yearly maintenance of your gutters in Glenrothes. Imagine the cost of having to have a full houses gutters entirely replaced by a tradesman? This isn’t something that often needs to be the case. Regular cleaning of gutters alleviates this concern. We will provide an inspection report to you on completion of all jobs. Do you have gutter damage in Glenrothes? we have the tools to fix this. We can apply a two part bonding agent on cast iron gutters that will seal the gutter again. We can also fix uPVC gutters should this need done. We are exterior cleaning specialists equipped to clean house and building facias, soffits and cladding , gutters , solar panels and conservatories. Our pressure washing for outdoor areas such as driveways, patios, mono block and decking is the best value for money and professional pressure cleaning service in Fife. Call us now on 07856 539498 or email using the Contact Us page for a free no obligation quote or further information.